Completing projects of singular beauty for high-end clients is a passion for Arizona watershaper Steve Oliver, and those clients return the favor by granting him a tremendous level of creative freedom. That’s surely the situation with the watershape seen here, where Oliver has sifted through a range of rich and contrasting elements to create a composition that’s as much a work of art as it is a pleasant place to go swimming. This project is an example of what can happen when you work under ideal conditions. Set in an affluent enclave in Paradise Valley, Ariz., on a spectacular five-acre estate, the home is a model of Old West styling, with the exposed wooden supports and smooth plaster exterior you’d expect to see in a house built in the Arizona Territory in the 19th Century. It’s also graced with all the comforts of a modern estate home. The homeowners are repeat clients of mine – and good friends as well. They’ve owned other properties in the area, and I’ve had the pleasure of working with them on three other watershaping projects in addition to the one shown here – perhaps our finest collaboration so far. They love art of all sorts, and when it comes to a home’s exteriors and especially to its water elements, they view the work as pure creative expression. Typically, their tastes run to the modern, which meant this home was something of a departure for them. It came with beautiful grounds, a winding driveway, gorgeous trees, a man-made brook and pond, all sorts of beautiful views – spacious, yet secluded, an oasis in the midst of crusty, arid, mountainous terrain. The place also had a small, courtyard pool. Typical of work done 20 or 30 years ago, it was something the clients knew they wanted to change – so they called me in with a request that I come with an unspecified something that would “pop” visually. There’s no creative outlet quite like working with clients whose main desire seems to be giving me a free hand to work with available spaces to the best of my ability. I opened my mind, spent time walking the property and took my time in weighing the possibilities. It was a free-wheeling process, given that they don’t place much by way of budget restrictions on what I do. They’re also enthusiastic when it’s time to discuss ideas, and I’ve always considered them to be thoughtful, helpful collaborators in the projects we’ve worked on together. 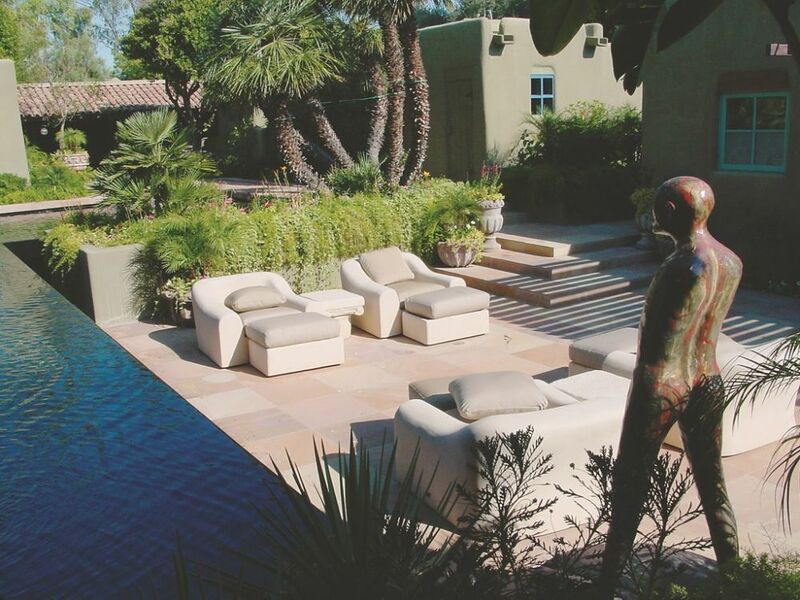 As you enter the space from the house (left), you take in a long view across the water to the dramatic sculpture standing at the far end of the pool. From the initial vantage point outside the home (middle), visitors see a wall of quarried stone interrupted with dense plantings – a slice of Mesoamerican jungle brought to new life. Seen at right, the water from the rough falls push ripples across the water that eventually settle into an even flow over a polished granite edge. But mostly they give me an almost unlimited level of creative freedom, and I can’t think of a better way to encourage the preparation of quality watershapes. The portion of the property with the old pool had been enclosed with a fence and always stood apart. There wasn’t much of anything going on within the space, and it felt lifeless and claustrophobic. In the new program, however, the wall is gone, elevations have been changed, and the views of the space from inside the house now expand across the water’s broad, reflective surfaces. In addition, the area beyond the old fence – once home to little more than shrubs, weeds and dirt – is now incorporated into the design as a verdant expanse that draws the eye up and away from the water. The raised fire pit adjacent to the sunken patio area is made from the same stone that was used to create the cascades above the pool’s surface. All of the stone was quarried in an area that produces large slabs of richly veined and textured material. This particular piece is about three feet by seven feet, two feet thick. We core-drilled a six-inch indentation and channel, then raised the stone off the ground on steel bars recessed far enough from the edges that it looks as though the stone is floating on air. When in use, flame fills the channel to interesting effect. The stone is a local product known as Farmer Beam. That may be a peculiar name, but the material has lots of rusts and browns on the surface and crisp gray tones when you break it open. It also has the virtue of coming out of the ground in the roughly square chunks we used to create a tumbled, rock-pile effect in the cascade structure. In this “new” space, we placed a large, L-shaped swimming pool that, by intention, works visually more as an art object than as a traditional pool. The long side of the vessel stretches away from an existing patio area and the large set of windows that open from a space used alternately for entertaining guests or relaxing. 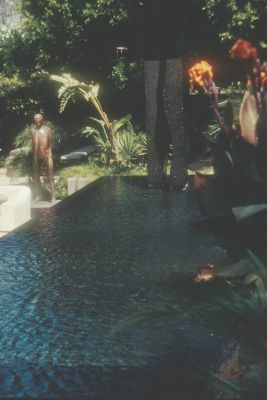 At the far end of the pool, about 50 feet from the windows, a large sculpture rises above the dark, reflective surface. The short side of the pool is about 30 feet long, which works proportionally with the 18-foot width along both axes. The depth ranges from three feet in the shallow end to six and a half feet in the deep end, and the vessel holds roughly 40,000 gallons of water. The simplicity of the shape makes it easier to lead the eye beyond the pool, whether to the lushly planted yard or to the sculpture. 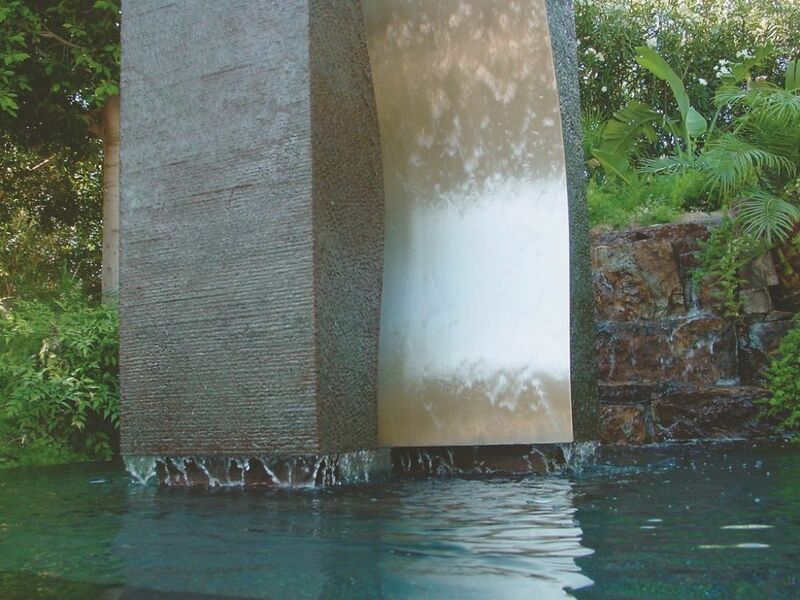 For its part, the sculpture has two vertical elements covered by a delicate flow of water over a textured metal surface. When lit at night, the sculpture rises in front of a stand of Ficus trees – the perfect shimmering backdrop for a shimmering waterfeature. The long side of the pool is flanked on the right side by a wall of quarried stone interrupted by plantings. Jagged cascades flow down the wall at a variety of flow rates. On the left side, the water flows over a vanishing edge and down a sheer dam wall surfaced in glossy black granite. Placed in this sequence, the ragged stone cascades resemble a ruin you might find in a Mesoamerican jungle juxtaposed with the smooth, granite linearity of modern architecture. 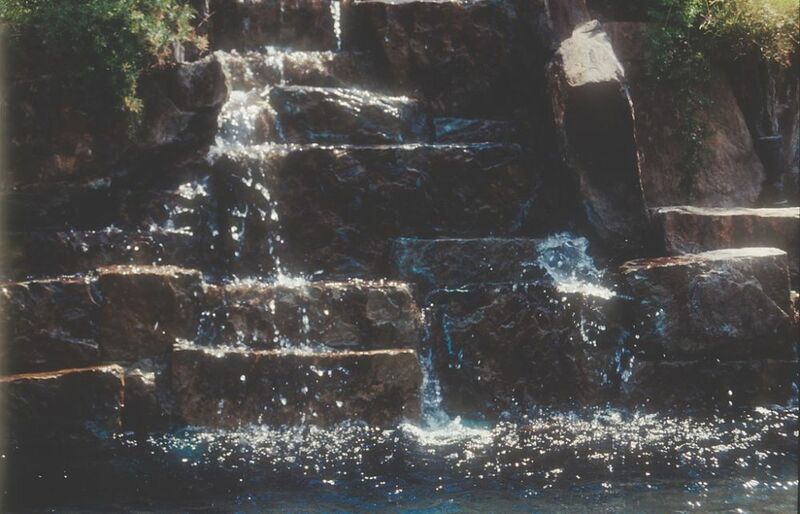 It is a testimonial to the trusting nature of these clients that they accepted without much question my idea of creating the stone ruins and cascades as a backdrop for a cool, pebble-finished, modernist pool and its sleek, modern sculpture. I saw it as a way to highlight contradictions and draw attention to the tension of the transitions. Entry to the pool comes via a series of stepping-stone pads in the shallow area. The pads are lit from below by fiberoptic lights – an interesting nighttime effect as the squares dance on the water’s surface and one that works well with the large Buddha set near the entry area. The water sheeting over the black-granite dam wall (left) offers a smooth contrast to the rough falls above – a key transition from the wild environment to a controlled architectural space. Nearby, the contemplative nature of the setting clearly emerges once you turn the corner from the waterfall and encounter the recumbent Buddha (middle). Nearby as well, the concrete furnishings and their soft pads offer a fluid and playful contrast to the rigid appearance of the dam wall (right). There’s a large conversation area set near a section of the vanishing edge. When you’re seated there, your eyes are right at the vanishing point, which has the effect of making the space surprisingly intimate. The cascades beyond seem to loom raucously in the distance, but up close, you can touch far calmer water as it sheets off the edge and falls over the polished granite wall. My clients and their friends all seem to love this particular seating area, but none of them has been able to put into words exactly what happens. The views across the dark water are very inviting, however, and I’ve been told that the experience inclines people to jump in the water and move toward the cascades – about as nice a compliment I’ll ever get as a watershaper. Entitled “Marriage,” the stainless steel and bronze sculpture at the end of the pool’s long side is by Archie Held, an artist in Point Richman, Calif. I first saw this piece in a smaller version in a landscape shop in Sausalito, Calif. When this project came up, I suggested that the homeowners should contact Held directly – which they did and subsequently commissioned the work. The metal surface of the sculpture is textured with small ridges that create interesting effects when a small flow of water is introduced. The sculpture’s striking form harmonizes with the modernist elements of the watershape and, like so much else going on in this backyard, works within the overall environment for reasons that are not entirely definable in words. The softly colored flagstone decking lends another layer of contrast to the design. Imported from India, the material features all sorts of subtle variations among pinks, creams, browns and grays. It’s cut in 24-inch squares, creating an understated checkerboard pattern and adding subtle visual textures. Even the patio furniture is part of the program. It’s made of concrete covered with soft pads. Together, the furnishings offer a nice sculptural touch to the area and stand out starkly against the black-granite backdrop of the dam wall. There’s also playfulness in the fact that, although they look like soft indoor furniture, the furnishings weigh a ton and sit outside year ’round. 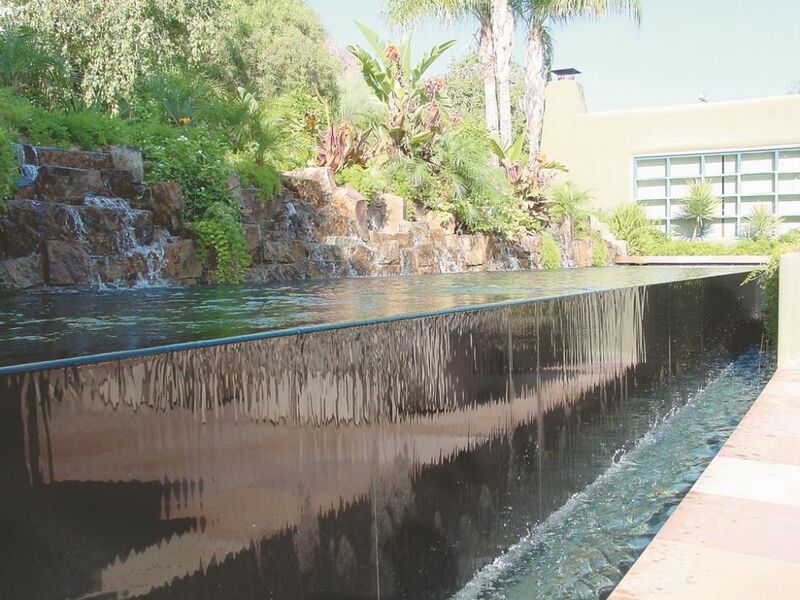 As mentioned earlier, the cascade wall has different flows across its length – four sections in all each driven by a two-speed pump that lets the homeowners tune the cascades to the mood or occasion. The pool was finished just in time for huge New Year’s Eve party, for which we programmed the Jandy One-Touch system to cycle through different flow settings to show off the variable effects created by the different flow rates. To be honest, I’m not exactly why I’ve been fortunate enough to work on not one, but four major projects with clients such as these. The trust they place in me is both affirming and inspiring, and I’ve found that it makes me work all the harder to rise to their expectations. When you couple that level of confidence with no real budgetary constraints, you have a situation that is as close to ideal as one could ever hope to find. For this project, I was allowed to use elements that some might not think to combine, but with my clients’ confidence I was free to build to my vision and, in effect, test my ideas. It’s been three years since we completed our work on this backyard, and it’s gratifying to see how much my clients continue to enjoy the pool and landscape – and to watch the area become even more beautiful as the greenery grows in a space maintained to near perfection. Steve Oliver is owner of Creative Water Concepts, a Scottsdale,Ariz.-based firm that designs and builds ultra-high-end custom residential pools and spas. He started his career in the swimming pool business 32 years ago, working as a laborer in his hometown of Chicago. 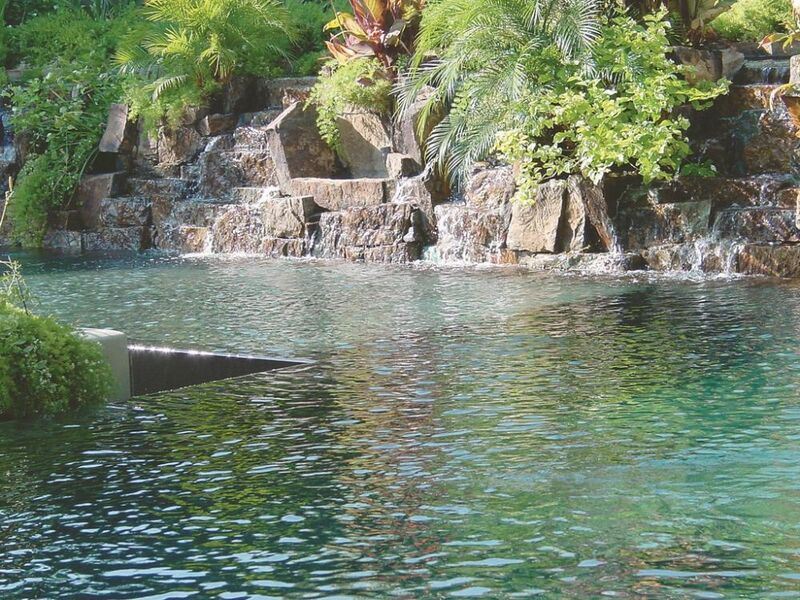 He steadily learned all aspects of pool and spa construction and eventually took to designing and overseeing his own projects from start to finish. Seeking a warmer climate, Oliver moved to the Phoenix area in the early 1980s and established his own firm there in 1986.